Line an 8x8 pan with waxed paper. Melt white chocolate chips in a double boiler or melt in the microwave in 30 second intervals, stirring after each interval. Stir in the frosting into the white chocolate chips. Spread into prepared pan evenly. Drop 8 drops of food coloring evenly spaced on top of the fudge. Using a knife swirl the food coloring. Sprinkle top of fudge with crushed peppermint candies and press down slightly. Cool for about an hour in the fridge. Once firm, turn fudge onto a cutting board and cut into small squares. This creamy Vanilla Peppermint Fudge only requires five ingredients which, in theory, should be easy to come up with. Unless one of those ingredients is candy canes…which in our house, are a hot commodity. The bottom half of our Christmas tree is suspiciously missing all of the candy canes. The culprit? My sixteen month old son, who is appropriately nick named “King Kong” for his destructive capabilities. When he’s not chucking the Christmas ornaments on our tree across the room he can be found hiding in a corner with both hands full of candy canes and a red stained mouth that condemns him of his crime. So don’t judge me that I had to pry a candy cane out of my little boy’s hand in order to make this fudge. My need for fudge trumped his need to eat yet another candy cane. I was surprised by how quickly I made this fudge and how delicious the result was. 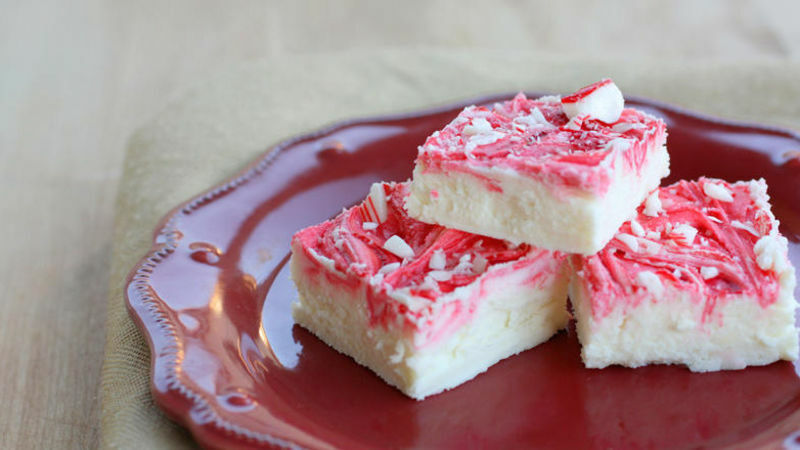 Festive and a treat to the eye, this Vanilla Peppermint Fudge would make a great addition to any Christmas plate and would make a great gift, too. Go Green: Add a little variety to your plate of fudge and use green food coloring for half of the batch.